Don't let your important correspondence and marketing efforts go straight from the mailbox to the trash bin with plain, dull, off-the-shelf envelopes. Give your printed envelopes some visual flair to boost your mailing response rates and make it more likely that your critical communications get read promptly. With the abundance of different envelope sizes, paper stocks and features, printed envelopes are a versatile vehicle for your brand identity. We've got the following tips to help you put some pizzazz in your envelope printing. How much attention do you give plain white envelopes? Envelopes are handy ways to deliver marketing materials anywhere in the world. Whether it's a greeting card, a fundraising letter or a collection of product information, if it's worth sending, it's worth sending in a compelling package. Your number one goal for your envelope design is to pique recipients' interest to open it up and see what's inside. The key is to grab attention quickly through use of color, images and text. An important secondary goal is to build brand awareness by making your envelope printing fit into the larger scope of your brand identity. Keeping your designs cohesive on your business cards, letterhead, envelopes and other marketing materials will put forth a professional image and create the strongest brand impact. Color - While black and white can make a bold statement with the right graphics, color usually packs a bigger punch. If you already have an attractive color logo, place it prominently on the front of the envelope. Or use backgrounds and/or images that reflect your company's personality. The beauty of custom envelopes is that they are printed flat, then "converted" into envelopes, so your design can wrap around the envelope, or you can inject visual appeal by contrasting the back or flap. Be sure to keep the top right corner available with a light background for a postal indicia imprint if you're having a mailing house send your mailing. 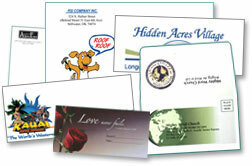 Images - Creative use of images in your stationery can really help you stand out from the crowd. Sometimes all it takes is a hint of an image faded in the background to instantly set the tone about who you are and what you offer. Text - To create a sense of urgency or draw special attention, use bursts of texts such as "Special Discount", "Urgent Time-dated Materials" or "Limited Space - Act Now!" Just don't overdo it, the envelope is the teaser - the contents of your envelope should do the selling. The real estate on a #10 Envelope allows more room than you think to get a message across. On larger envelopes, such as 9 x 12 Booklet Envelopes, you'll have more space to play with, although a simple tag line and a pleasing design may do the trick to avoid your envelope getting tossed without a second glance. An important part of the design is the paper you choose for your envelope printing. Smooth or textured, you'll want a quality uncoated stock that you can run through your laser or desktop printer for addressing. Smooth 70 lb. stocks, show off your color designs the best and are the most cost effective, while textured 24 lb writing stocks such as linen or laid offer a nice tactile, high-end feel. To match your letterhead and envelopes more closely to your business cards or brochures printed on glossy or dull/matte coated stocks, go for smooth stock. With custom envelopes, you don't have to sacrifice quality for environmental responsibility. Choose environmentally responsible papers, or ask about fine writing papers that include recycled content. Envelopes are one of those things that everyone forgets about and takes for granted. Put some thought into designing these precious packages to ensure you connect with your customers and get a fair shake in your direct mail marketing efforts. See more corporate identity and business stationery envelope designs.